You won’t believe the flavor of this awesome soup. 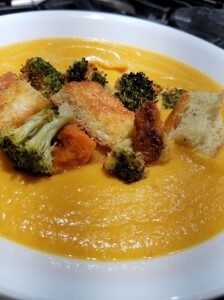 Everything comes together as an explosion in your palate!I made several changes to deepen and enhance the flavors of this recipe originally from a cooking magazine, but cannot take credit for the originality of this delicious and healthful soup! Preheat oven to 375 degrees. You will need two rimmed baking sheets. After prepping your veggies, mix together and spread the first 5 ingredients on one of the baking pans. Drizzle with 1 ½ to 2 Tablespoons of olive oil and sprinkle with salt and a grind of pepper. Next, mix the butternut squash and broccoli florets together and likewise spread them out on the other baking pan. Drizzle with remaining olive oil, sprinkle with salt and a grind of pepper. Bake both batches of veggies at 375 degrees for about 40 minutes or until everything is tender. They should both take about the same amount of time to cook. Let the veggies cool. Once they are cool enough to handle, the veggie tray with the carrots can be placed into a blender. Add the coconut milk, cannellini beans, including liquid and fresh ginger. If you have a Vitamix, all the better! This will be done in a flash! If not, you may have to do this in 2 batches. Pulse, then puree until completely smooth. You may also use a hand blender. If you choose this option, just pour everything into a saucepan and blend until smooth. Once done, heat the finished soup until hot and adjust for salt and pepper. For serving, top the soup with roasted squash and broccoli and add croutons or pepitas to your liking. This is a good use of old crusty bread, rolls or whole grain bread that is just a little over the edge for your sandwich. Onion rolls make particularly delicious croutons! Preheat oven to 400 degrees. Set rack in center of oven. Spread bread over baking pan. Don’t crowd the pan. You want to allow enough room so that the croutons can brown on all sides. Drizzle with the garlic-infused olive oil and sprinkle with salt. Bake the croutons for 12 to 15 minutes, but watch them! Cooking time will depend on the density of the bread – the less dense the bread, the quicker they will brown. They may take more or less time. You want a nice golden color.